My baker refused to bake me a cake with Malaysia flag! He said in previous years, they (the bakeries) used to do it for Merdeka. But last year, some moron (my own description, not his) said it is against telur (the law) to eat our Malaysia flag. PUTRAJAYA: It is not appropriate to bake cakes with the Jalur Gemilang design on them. According to the Prime Minister’s Department’s ceremonial division and international conference secretariat, it is not proper to make cakes with the national flag design on them but it has now become a practice by many people. “Some people think that it is all right to bake cakes with the national flag design on them, but actually, it is inappropriate because later, they will be cut and eaten. The gesture is not appropriate,” a spokesman from the secretariat said today. So, he said he cannot do it. No problemo. The 5xmom and sons got a way to deal with it. You see, I thought of contributing a cake for my church youth group’s Merdeka BBQ this Saturday. So, I ordered a 2.5 kg cake. Since the event is for youths age 13-35 years old, I cannot bring a Doraemon or Teletubbies cake which bakers are used to bake. So, I thought why not make a Malaysia flag cake. Since my dear baker is so afraid, my sons and I thought of a good idea for a cake. No, it is not Pakla cake (‘cos baker cannot bake cake tanpa teloq). Hahaha. You will have to wait to see what cake we ordered. It is so funny the bunch of us were laughing so hard at the baker. 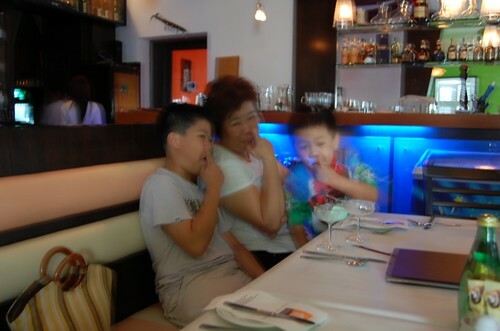 We are acting the ‘dig our nose’ pose at the restaurant where we had lunch. You do not need to tell me my eldest son looks like me. I know liao. All come from my womb, sure same face lah. Next Next post: What’s going to happen in September? alexallieds last blog post..How to carry a Semi-D on your hand? Nice t-shirt… Wonder where I can get it so that I can stand next to my boss.. KAKAAKAK!!! 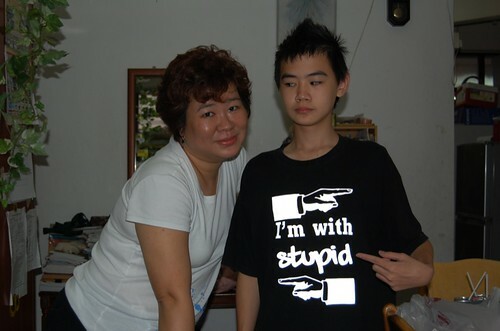 Angie Tans last blog post..Beijing Olympics Closing Ceremony… WT*…..
Why is the young one flipping the bird??? Bwahahaha!!! Tan Silly – It is a birth disorder. The moment the camera is out, that finger will popped up. You go see my Facebook album under ‘Family’. Every single picture also he did that! Grrr…..
alex – He automatically flipped it. Scold also useless because he just love to did it when we are about to snap. 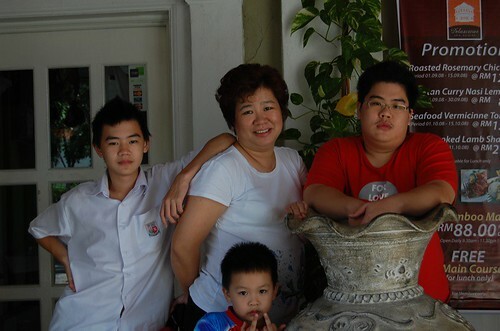 PenangTiongHua – People say if sons follow mother’s look, very lucky wor. 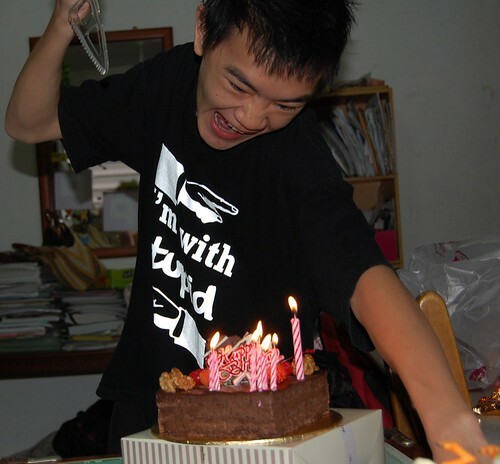 Btw, please pass my belated happy birthday message to Mikey… (sorry for being late… :-P). Lastly, do enjoy yourselves tomorrow! You really look so young wan! Birds Talking Toos last blog post..Censorship? Ps: Wah.. you Virgo also ah? I married one and gave birth to one …. real terrer one lo ! … hahaha…… tell me about it!! My son same face like me oso! 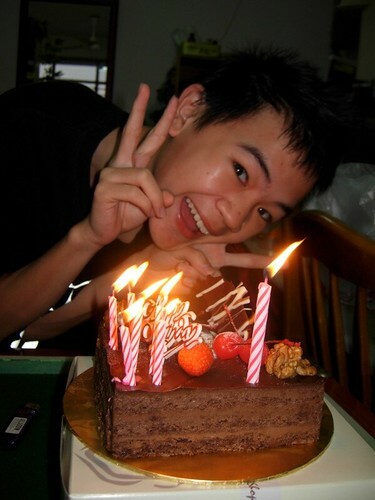 yr mikey 16 or 20 ? thot he lahir in 1988?